Born, raised and educated in London, England, my wanderlust started from a young age, frequently straying from home, only to be found at various food shops being entertained by the owners and sampling their delights. I guess this was the start of my interest in all things foodie! Fortunately my interest in wine followed in my adult years rather than at the same time! This first real taste of fine food was whilst working at a top Relais & Châteaux hotel in Southern Ireland. This opened my world up to the pleasures of first-class international wine and cuisine. Since then my path has taken me to live in Australia and travel to nearly 80 different countries. Each place has allowed me to feast on the region’s finest wine and food. I spent many years as a Travel Agent in England and Australia where I had the opportunity to start my exploration of the world and fulfill my desire to learn about other communities and cultures. This of course continues. My list of ‘countries still to see’ remains lengthy, but I am eternally grateful that the place I come back to is Cape Town. I’ve been living in Cape Town for 20 years and during this time I have come to believe that, not only is the Cape the most beautiful place in the world, but it is also a gourmet’s dream come true. With over 700 wine estates and cooperatives in total to explore, my passion for wine and food never fades and I take absolute delight in showing my clients the beauty of our precious Cape Winelands and the first class wines that South Africa is proud of. Not to mention the very fine brandies, gins, beers and ports that South Africa is producing. Take a trip in any direction and you will uncover hidden gems. My own weekend trips meandering through the countryside, have given me an addiction to see what lies ‘just over that hill’. I’m rarely disappointed in the amazing finds of sleepy little hamlets, or majestic views from the top of ‘that hill’ where it feels as if one has entered a dream. I have my own travel and tourism business along with working for many International tour operators, my preference is to specialise in wine, food and cooking tours so I’m constantly keeping abreast of the possibilities of tasting the best. This doesn’t always have to be the 5 star places as some of our more humble establishments offer the finest. 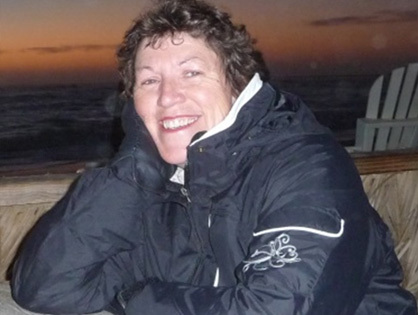 I’m a trained and registered Western Cape Tour Guide I’ve also completed my Cape Wine Academy Certification course and I´m actively involved in the Muizimbiber’s Wine Club – a club which meets fortnightly throughout the year and I helped found almost 30 years ago! I also am a member of the Slow Food Society!